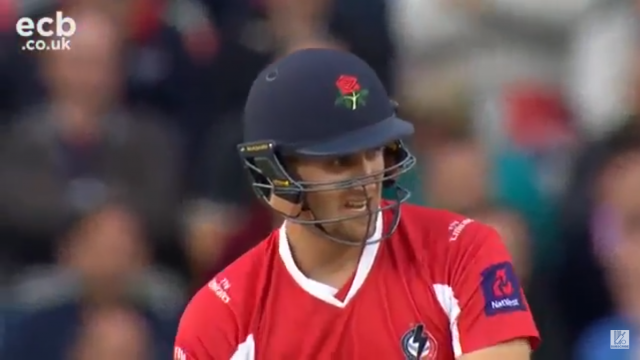 Lancashire’s death bowling ensured they won a third consecutive T20 Blast match and condemned Derbyshire to their fourth defeat of the competition. The Lightning’s total of 157-8 might have seemed a touch below-par, albeit on a slow wicket, but their bowling unit and impressive fielding ensured it was more-than-enough. Derbyshire had put in an excellent bowling display of their own, clawing Lancashire back after a rapid start by the hosts. It gave them every chance of their first win of the competition, but ultimately they left empty-handed. Liam Livingstone, who struck a century in the away match against Derbyshire, was at his destructive best in the powerplay and raced to 44 from 21 balls – sharing a fifty stand with Alex Davies for the opening wicket. Livingstone fell with the final ball of the powerplay, the score on 68-1, and that seemed to shift the momentum. With the introduction of their spinners, Derbyshire began to slow the rate and picked up wickets with great regularity. Davies departed for a well-made 31, before Arron Lilley ran himself out for 11. Plenty of batsmen found it hard to get going on the slow pitch against the softening ball, Keaton Jennings and Dane Vilas batting at less than a run-a-ball during their innings. Matt Critchley struck twice in the 15th over, removing both Jennings and Vilas. Lancashire kept struggling for runs and lost three successive batsmen for ducks – Steven Croft, James Faulkner and Toby Lester. Jordan Clark struck a valuable six with the penultimate ball of the innings to give Lancashire a touch of momentum and kicked the total to 157-8 after their 20 overs. Derbyshire’s reply got off to a faltering start, losing Ben Slater in the first over as he belted Toby Lester straight at Jordan Clark at cover to depart for just five. The Falcons also lost Wahab Riaz inside the powerplay and were significantly behind where Lancashire were at the same stage, finishing the first six overs on 41-2. But a half-century partnership between Wayne Madsen and Calum MacLeod got them back up with the rate and at 73-2 after nine overs, things were looking good for the visitors. Keaton Jennings picked up the key breakthrough with his occasional medium-pace, dismissing MacLeod with the final ball of the 10th over. Lancashire then began to apply the squeeze with their spinners. Matt Parkinson struck twice to get rid of Madsen and Gary Wilson, Derbyshire stuttering to 103-5 with five overs of their chase remaining – still requiring another 55 to win. Daryn Smit though injected fresh life back into the Derbyshire ranks. He progressed to 25 from 18 balls alongside Matt Critchley and took his side to a position of needing 23 from the final two overs. But two magnificent overs from James Faulkner and then Lester clinched the victory for Lancashire. Faulkner’s penultimate over went for just five, leaving Derbyshire needing 18 from the final over. Lester conceded just five again, plus claimed two wickets as Critchley and Smit were caught in the deep. A 12-run win then thanks to a fine display of death bowling from Lancashire which clinched their third successive victory in the T20 Blast. The win lifts them to second in the North Group behind Worcestershire, while Derbyshire remain second-bottom – ahead of fellow winless side Northants. “The spinners have been terrific and it’s really good knowing that they can do that at our home ground. They are very hard to hit and it’s working for us at the moment. “We can just keep doing what we are doing, the atmosphere we are creating at the moment is really good to be around. Going out there and enjoying ourselves, it would be lovely to keep going and to keep winning. Let’s just see what happens.